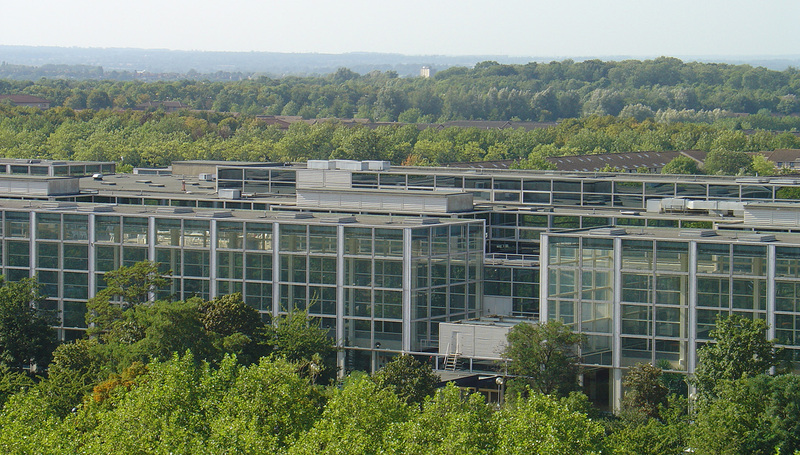 Learning from experience underpinned the development of Milton Keynes. As the city looks forward another 50 years, David Lock Associates have re-published Milton Keynes Development Corporation’s City Structures report both to share the insights that were regarded as important during the formative years of Milton Keynes and to continue the good practice of critical review. Will Cousins AoU, of David Lock Associates and previously the Milton Keynes Development Corporation looks at the report then and for the future. The 50th anniversary of the founding of Milton Keynes is a year of celebration and it is also a time to review and reflect on what lies behind the undoubted achievements of the first 50 years. Review is a natural part of the process of city building; understanding breeds respect and it helps those who are responsible for decisions that will affect the future of the city justify their decisions and actions. In light of this commitment to learn from experience, in the late 1970s, the Milton Keynes Development Corporation (MKDC) commissioned its urban design unit, headed by Stroud Watson, to carry out an internal review of how the city was being planned and designed. It was by then some 10 years into its implementation programme and at a pivotal point in its evolution. This review instigated, in effect, Milton Keynes’ first renaissance. Although it did not cause even a missed beat in the inexorable pursuit of building the new, it set the growth plans and the city in a completely new direction. It was, with conscious purpose, an opportunity to examine what had been achieved so far and how the Development Corporation could best equip itself to address the opportunities and challenges of a changing political and economic landscape, in what became known as the ‘Thatcher Years’; MK positioned itself to respond to the free market economy and the explosion in private house building that was to follow. 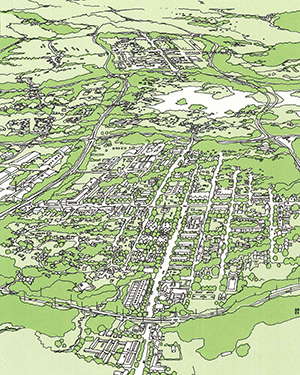 This changing landscape and political emphasis led to one of the six goals of the Master Plan published in 1970 ‘1 Opportunity and freedom of choice’ being taken up by the MKDC design team, with urgency and energy. Unconstrained and limited only by their creativity and imagination, the designers of the early years of MK set about populating the city grid with contemporary ideas for living, from modernist patterns on orthogonal grids embracing fashionable Scandinavian settlement models to organic settlement in the English village tradition. 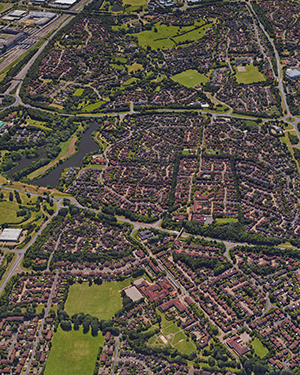 The masterplanned housing projects realised in MK during the 1970s and 1980s are now widely acknowledged as some of the most influential examples of modern domestic architecture and planned communities. Clearly experimentation permeated the work of MKDC’s design team across planning, architecture, landscape and infrastructure design. The range of design approaches the team adopted and applied across the city plan is striking. As the 20th century was coming to a close, the Development Corporation’s designers and planners were drawing on lessons learned from previous ‘grand projects’ in public sector housing as well as the traditions of the garden cities movement, and having to adapt to a growing interest and reliance on the private sector housebuilder. While this contributed to a rich and varied offer, within which new residents could make their home, there was a sense that some of the original goals of the master plan and City Structures report were not being met. The City Structures report was prepared at a time when the image and identity of Milton Keynes were fiercely protected and any suggestion of criticism of the achievements, no matter how well intentioned, was naturally going to be resisted by the executive. Many copies were subsequently shredded because the report criticised earlier approaches to the design and development of some of the first generation of grid square master plans. But the authors of the report, and those who assisted in its preparation continued to work to expand the city, and carried on pursuing the application of the principles introduced by the review. In 2017, almost 40 years on from the publication of the City Structures Report it’s worth taking a trip to Great Holm to see how the principles have matured. The main local routes support bus and cycle journeys, the community and commercial developments have flourished and the landscape has, of course, matured. When asked, residents are not slow in coming forward with positive comments on where they live. These lessons need to be gathered and shared and incorporated into the next round of planning as Milton Keynes prepares for the next 50 years. The MK Futures 2050 report, published in 2016, shows signs of the spark and energy that infected the former Development Corporation’s thinking and activity. There is talk of six ‘grand projects’ to carry the city forward and a renaissance in Central Milton Keynes. How do we articulate what has and hasn’t worked in Milton Keynes in such a way that it is helpful to those who have the daunting but exciting challenge to write the next chapter? Milton Keynes needs a critical friend more than ever; we hang on to the past ever more tightly as we fear the future. The City Structures report is evidence that with confident and articulate critical review, the city has the self-confidence to adapt and change and more importantly equip itself for the challenges and opportunities that lie ahead. If you would like a copy of the reprinted City Structure report please email [email protected] Postage may apply depending on your location.